Sydney’s long-awaited Northern Beaches Hospital has been officially opened. The 488-bed facility in Frenchs Forest, built at a cost of $660 million, is a Private-Public Partnership between leading healthcare provider Healthscope and the New South Wales Government. Up to 60 percent of the beds will be for public patients, with 40 percent for private patients. Patients in the Emergency Department will all be treated as public patients; if they are then admitted to the hospital, they can choose to be treated as either a public or a private patient. Northern Beaches Hospital replaces both Mona Vale and Manly hospitals. Healthscope managing director and CEO, Gordon Ballantyne said the company’s business model was founded on “the highest quality of care, delivered efficiently, compassionately and innovatively”. “Accessible and high quality healthcare has a vital place in every community,” he said. In the next four to five years, Northern Beaches Hospital will have total admissions of 52,000 per year and a 50-bed emergency department which will see 50,000 presentations per year. It will feature 14 theatres, two cardiac catheter labs and four procedural rooms, as well as birthing, intensive care, paediatric, renal, cancer care and mental health services. The GP Medical Centre will treat 25,000 patients per year and outpatients are expecting to see 23,000 people per year. Other facilities include medical imaging, pharmacy and pathology, as well as an Education Centre for doctor and staff training. “We are confident that we have the team and the plans in place to navigate the inevitable challenges associated with ramping up a facility of this scale,” Mr Ballantyne said. His thoughts were endorsed by NSW Premier, Gladys Berejiklian, who said the opening of the hospital was ‘momentous’, offering the people of the Northern Beaches ‘a world-class public hospital like no other’. “Together these facilities will ensure that our local communicates here on the Northern Beaches have access to healthcare and specialised services, now and well into the future,” Ms Berejiklian said. Speaking at the opening event, Healthscope chairwoman, Paula Dwyer, said the landmark project was delivered on time and on budget. “The first patient was transferred and admitted three weeks ago on October 30, the exact day we committed to four years ago when Healthscope was awarded the contract to design, build and operate the facility,’’ she said. “Healthscope has been entrusted with a 20-year agreement to operate the public section of the hospital until 2038, and a 40-year agreement, to 2058 to operate the private section. “Northern Beaches Hospital is the centrepiece of more than $1.5 billion invested by Healthscope in growth projects in the past five years and it will be the cornerstone of the company’s planned growth for years to come. 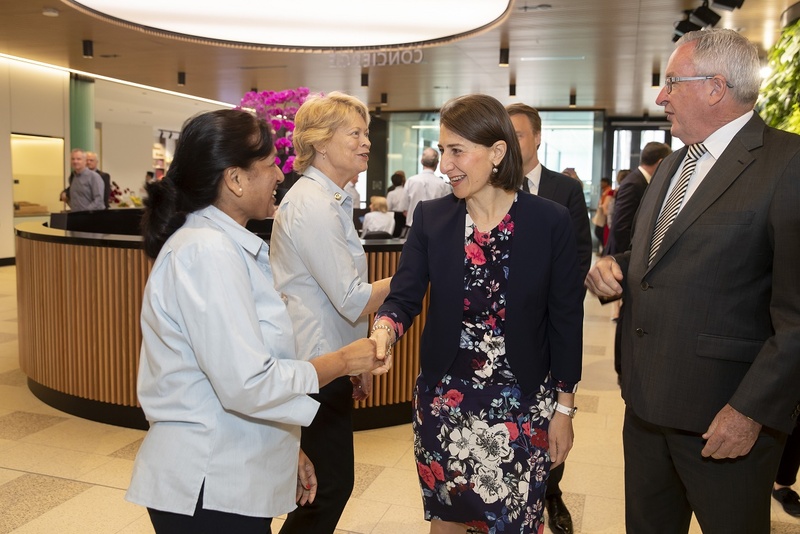 The ribbon cutting at the hospital opening was attended by NSW Premier Gladys Berejiklian and NSW Minister for Health, Brad Hazzard, as well as hospital staff and members of the community.